PLEASE NOTE the earlier than usual start time, due to the Annual General Meeting. many of which you may have never seen, gleaned from the above two Facebook groups. identify people, places or events so that we can add detail to our ever-growing archive. Click here for the poster advertising this event. 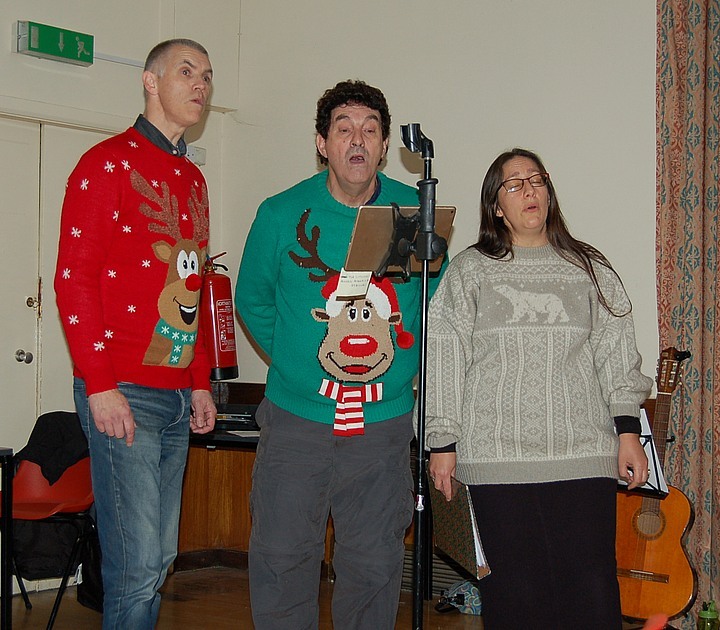 Scroll down for some pictures and information about our recent events. Our calendar of forthcoming events is available on the What's On page. Click here to jump to the section about the '360' video of the Remembrance event. "Projects" are an important part of our activities and we welcome help with these. Please see our current list of ongoing and future projects for more information. We are very sad to report the death of our highly-regarded Chairman, Bill Hudson, on Friday 18th January. 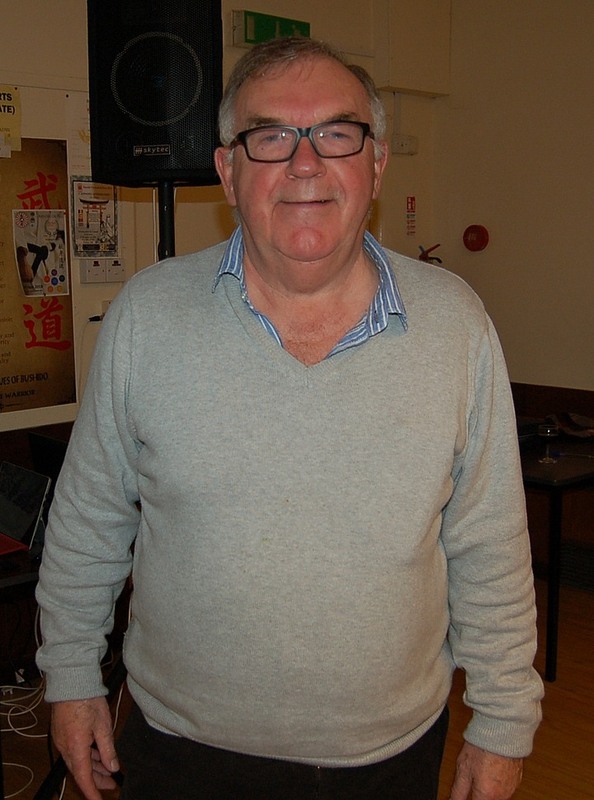 Bill founded our Society in 2005 and as a result he received a well-deserved Most Outstanding Personal Contribution Heritage Award in July 2006. He was an accomplished photographer and built up a wonderful collection of photographs of Roade people and places. Many of these appeared in “Roade Through the Camera”, which was published in 2009 and dedicated to his beloved wife Jean, who died in 2004. After suffering a severe stroke in 2013 he continued to attend and contribute to meetings as much as he could. We shall miss him and plan to have an annual photographic competition in his memory. Click here to read a tribute to Bill. For more details of the photographic competition, click here for the entry form. This is excellent news as there was stiff competition and we were advised that “the calibre of the entries was superb and ... it would have been justified if at least half of the entries had been awarded joint winners”. 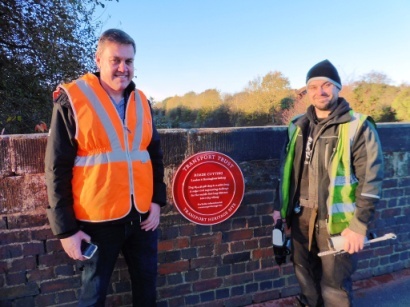 The Transport Trust Red Wheel was mounted on the north side of Hyde Road bridge on Friday 2nd November by village resident Tom Roberts, director of TJR Engineering in Milton Keynes. Mike Lightwing, Network Rail regional Asset Protection Manager and also resident in Roade, was present to confirm the agreed siting. 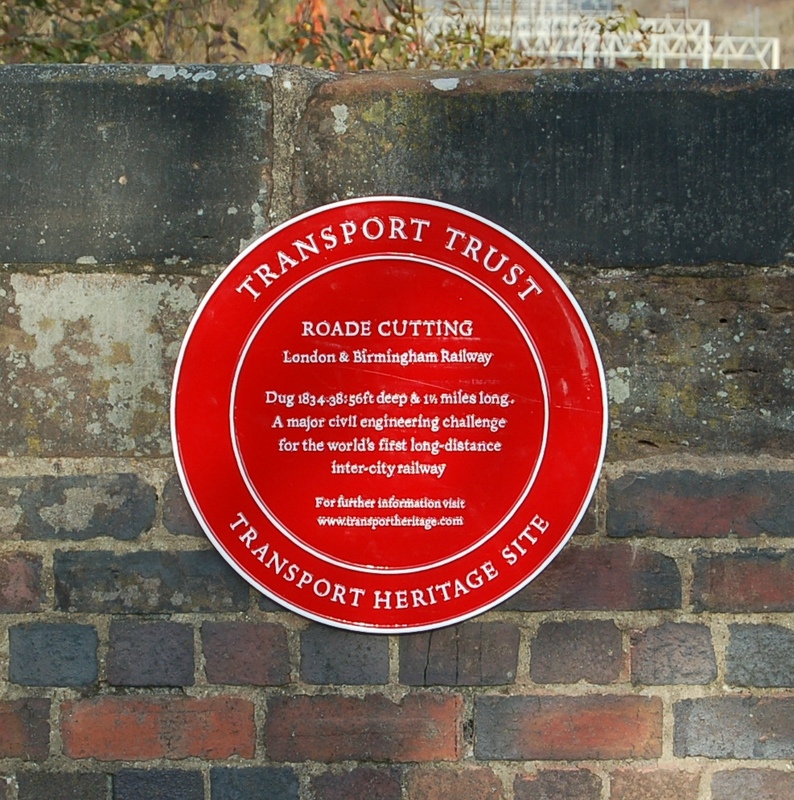 It commemorates Roade Cutting, one of the last and most protracted of engineering feats that enabled the opening in 1838 of the World’s First long distance inter-city railway: The London and Birmingham Railway - still in constant use 180 years later. 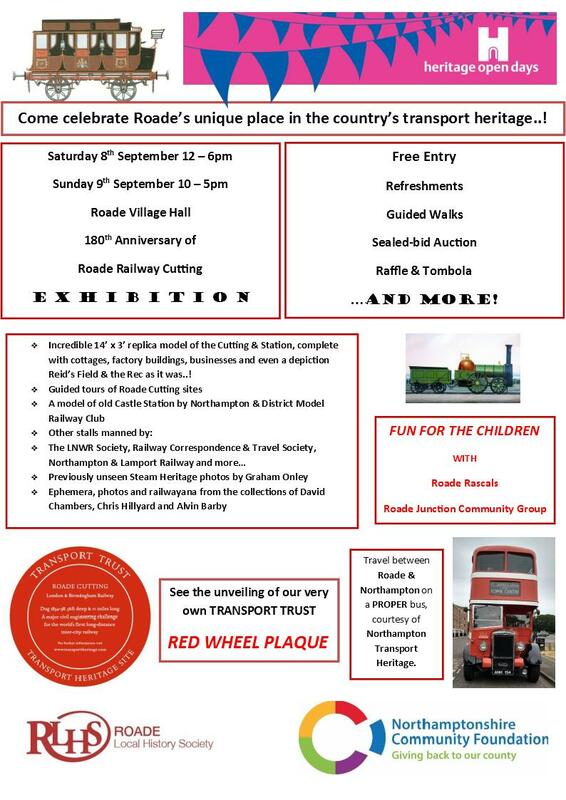 The Red Wheel scheme is designed to raise awareness and appreciation of the best of Britain’s transport heritage amongst a wider and younger audience by commemorating significant transport places and objects. Ours is the 102nd awarded since the scheme started in 2009. They are the equivalent of the English Heritage Blue Plaque scheme that commemorates significant people and their association with the buildings on which the plaques are mounted. Roade Local History Society is grateful to Milton Keynes Heritage Association for funding the manufacture and installation of the Red Wheel. 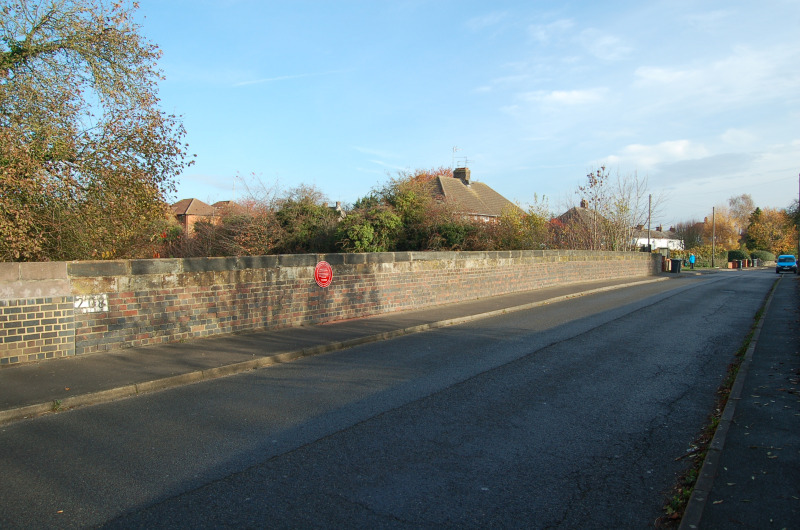 The site of the Red Wheel on the Hyde Road bridge. Visitors to our 180th Anniversary of Roade Cutting exhibition may have noticed prints of artwork by the late Barry Freeman. We now have only 2 prints remaining. They have slight edge damage which would be covered by framing and are therefore being offered for sale at £15 each + p&p. Please contact us to place an order and discuss delivery/collection. A signed print (unframed) of ‘LMS – THE LAST DAYS’ depicting Stanier ‘Pacifics’ Nos. 6203 ‘Princess Margaret Rose and 6233 ‘Duchess of Sutherland’ at Roade Station, Northamptonshire, December 1947. By (the late) Barry Freeman BA., G.R.A., F.R.S.A. 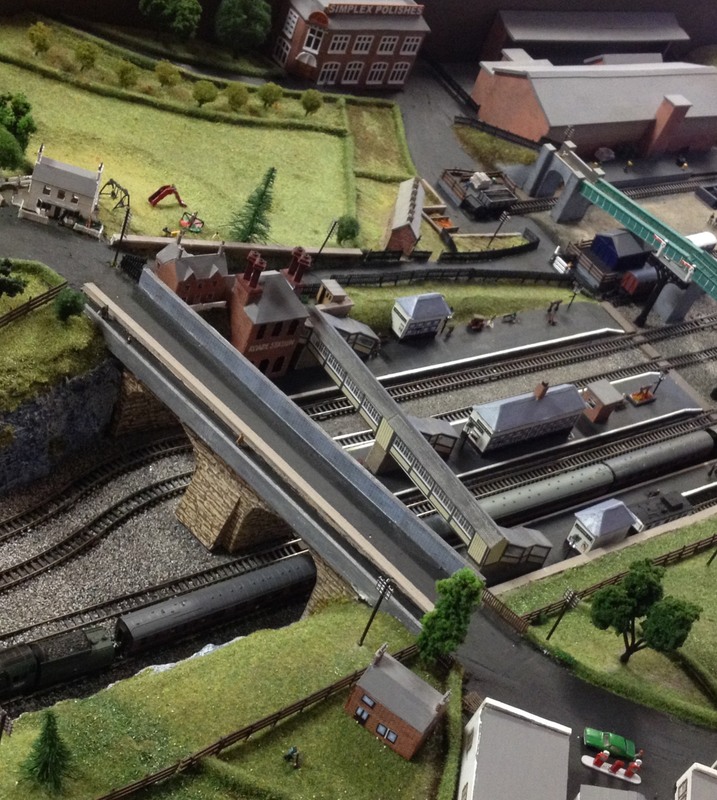 Barry, who was born in Northampton, educated at the town’s grammar school, and was living in the town on his death, was a childhood trainspotter and, due to his roots, a committed LMS enthusiast. His first recollection of trains was going on a family holiday to north Wales in 1946, when he would have been eight or nine. After completing his education he served in the Royal Navy for 10 years, following which he had several years in the electronics and aviation industries before becoming an art teacher in 1971. Eighteen years later he took early retirement and became a professional artist, painting mainly railway, but also aviation, subjects. Since 2007 we have been interviewing local residents as part of our Oral History project and we have made these available for purchase on CD. The interviews each last about an hour (though some are much longer) and can make excellent gifts. Income from these sales helps us to fund our various projects and exhibitions. RLHS is compiling a database of memorials such as benches etc in the village, and details of people so remembered. If you know of one, or have details (especially photos) of these villagers, please contact us. 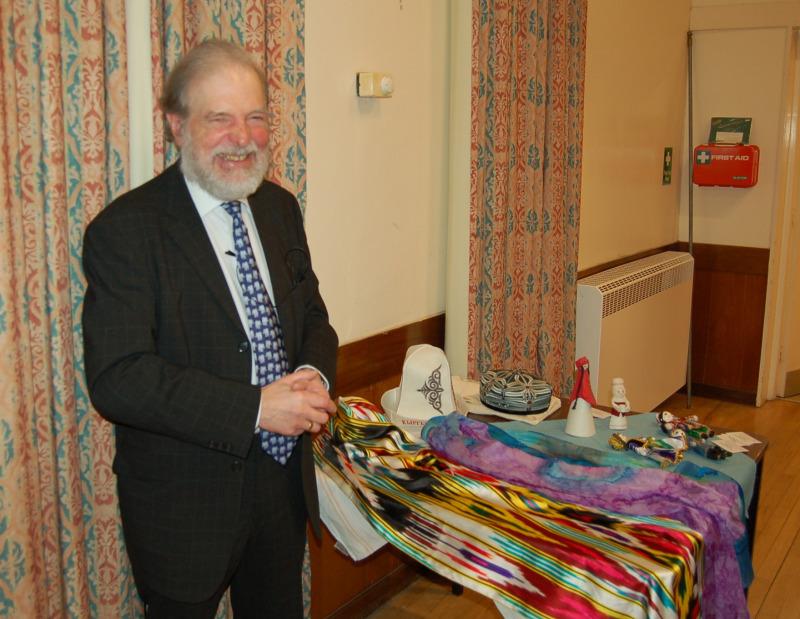 Ray Rowlson gave a fascinating talk about his travels on the Silk Road with his wife Jenny. His wonderful photographs made us feel we had been on the journey ourselves, seeing the beautiful scenery and buildings, shopping in the markets, eating exotic food, meeting friendly people and learning some history too. Roade residents Syd Humphrey and Humphrey Cripps were hard working well educated cousins who made a significant contribution to our village life. Their shared enthusiasm for personal hobbies produced nationally important collections of butterflies, show birds and postage stamps. Their successes included the famous Chartwell Stamp Collection Auctions of 2011-2012. 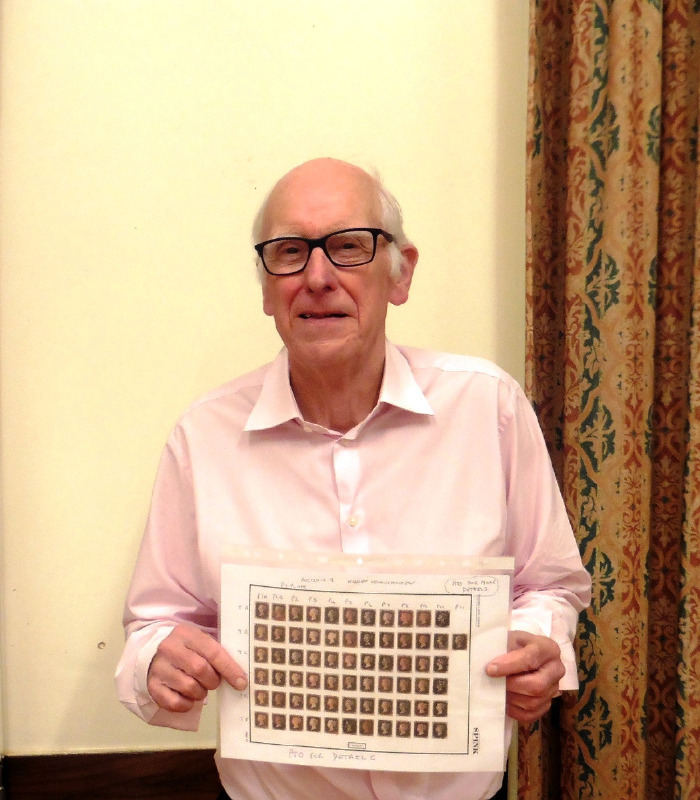 Many thanks to committee member Peter Mawby for giving us such an excellent talk - well pitched to interest and entertain everyone as well as giving an insight into extreme philately. Our Christmas event was very enjoyable. David Wortley gave us a fascinating talk about his spherical videos and brought headsets so that we were able to have a truly immersive experience. 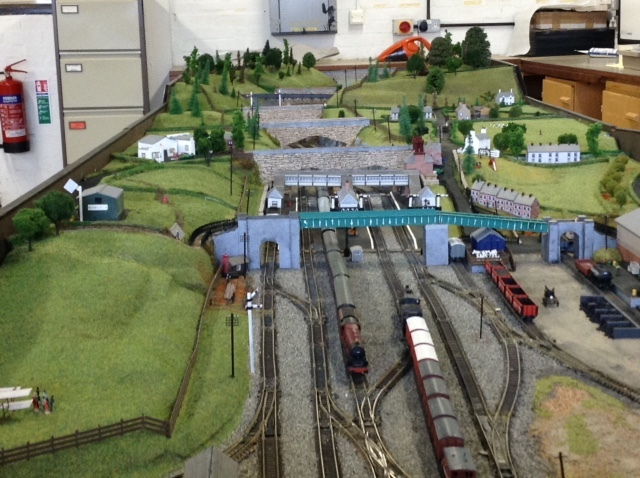 Scroll down to learn more about David's work including the videos he made of our September Roade Cutting Event and the video and interactive map of Roade on Remembrance Sunday. 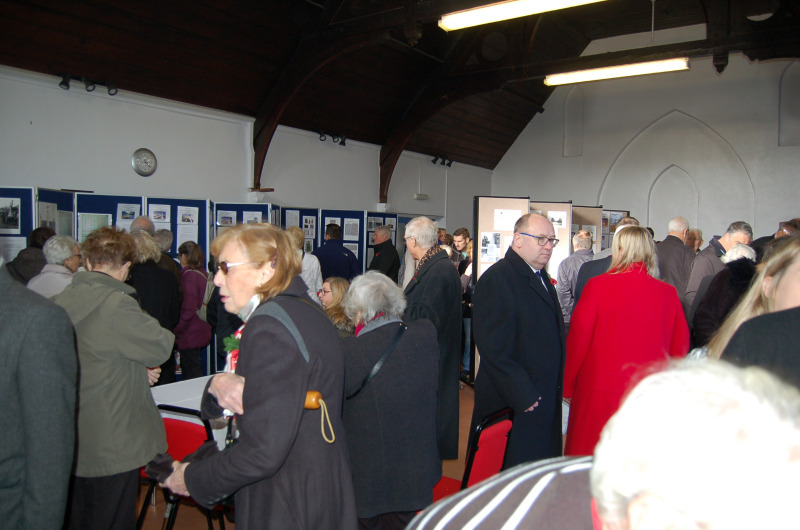 The Exhibition was very successful and provided information about men from Roade who died in the service of their country in the two World Wars, including some who do not appear on the village war memorial, and six Canadian airmen who lost their lives when their Wellington bomber was struck by lightning over Roade in 1944 (a memorial to the airmen was dedicated on 9th November 2014). The Roade Roll of Honour folders in St Mary’s Church and Roade Methodist Church were produced in 2008 by Gordon Hall with the help of members of Roade Local History Society and the Royal British Legion. They have been updated with various amendments and additions resulting from further research and information received in the last ten years. In particular, details have been added about the Canadian airmen and two men whose graves in Roade Cemetery are designated as WWI War Graves and are commemorated by the Commonwealth War Graves Commission. all those who provided exhibits and helped at the event. The 2018 Remembrance Service and Roade Roll of Honour Exhibition were attended by David Wortley of 360in360 Immersive Experiences, who has kindly posted to Youtube a spherical video he took of the event. In this, it is possible to pan around the video (left and right, up and down) as though you were there at the time and turning your head...........drag the video around on the screen with your mouse or use the arrow controls in the top left of the Youtube videos and have a go! You can navigate around this map in the same way but you can also click on the hotspots to jump to different places and find out more. The soldier hotspot will take you to another scene related to where he is standing. The biplane hotspot will always bring you back to the map and the cameraman hotspot will show you a video related to where he is standing. The poppy hotspot will bring up a text box and/or a picture with more details. The '360' logo hotspot will tell you more about what David does and connect you to his web site at http://www.360in360ix.co.uk/specialoccasions.html which shows you the interactive map “embedded” into his web page. 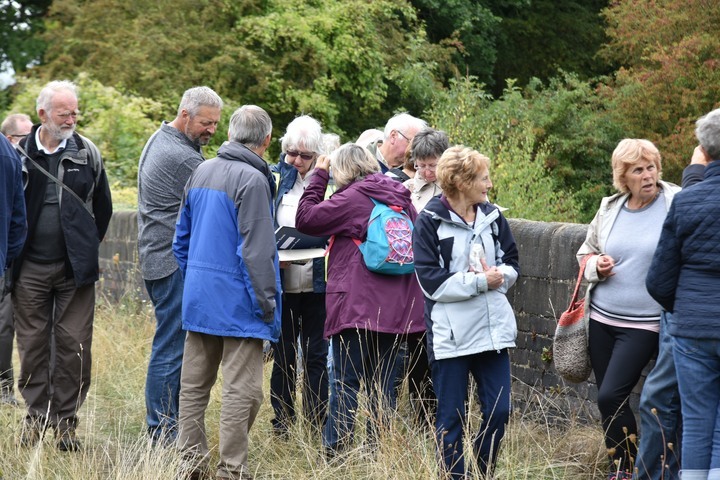 You may also be interested to see some similar videos taken by David at our recent event celebrating the 180th anniversary of Roade railway cutting. 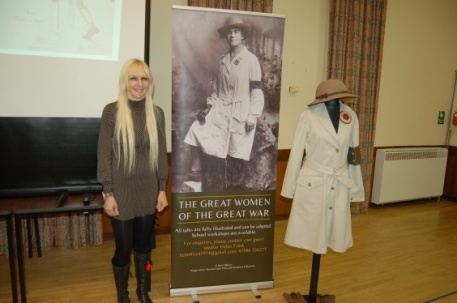 Helen Frost held everyone spellbound with her fascinating talk about the Women’s Land Army in World War 1 and their role in combating life threatening food shortages. a teacher at Roade School (now EWS). Thank you for supporting our Grand Exhibition. We hope you enjoyed it. Many of the pages on display in the centre of the Main Hall will be incorporated in a forthcoming publication. It may take us some time to get there so please keep visiting our website for news. We have available for sale some signed prints of "LMS the Last Days" by local artist Barry Freeman. Click here for more details. The Lucky Souvenir Programme first prize of £50 has not yet been claimed. The winning number is 256. Would the winner please contact our Treasurer, Mr C. Denton, on 01604 862300 to arrange collection at a convenient time. The winning programme must be produced when the prize is collected. If collection is a problem, please discuss with Mr Denton. Delivery may be possible at cost. The winning programme will need to be sent to us for verification and will be returned with the prize. 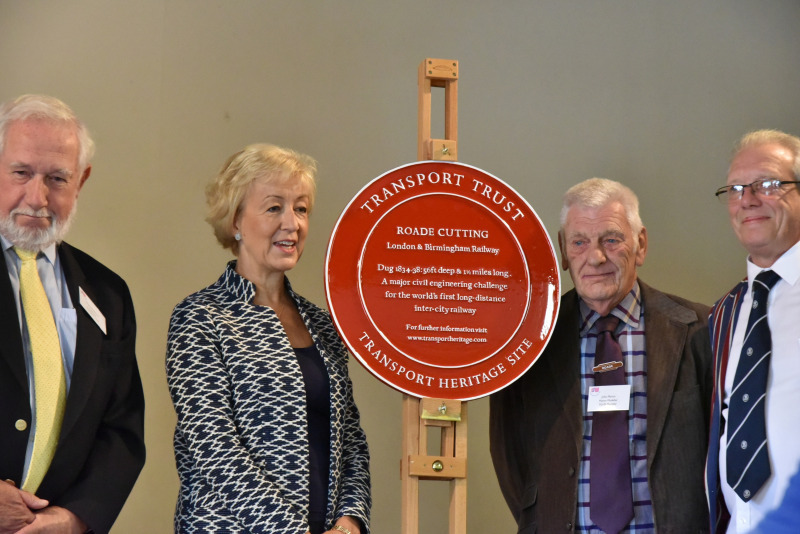 This prestigious award, which recognises the Roade Cutting as a National Transport Heritage Site, was unveiled by Stuart Wilkinson, Chairman of the Transport Trust, and Chris Hillyard RVM, Roade Local History Society. Click here to see the poster advertising this event. 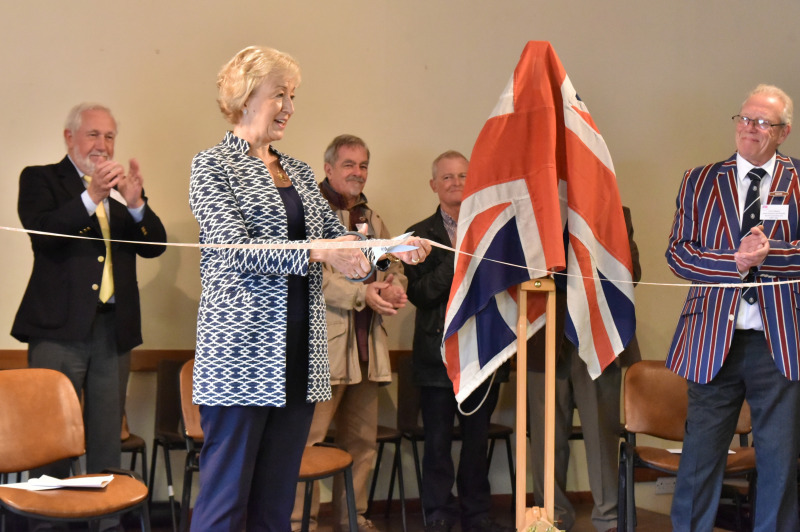 Roade Local History Society's main event for the year celebrated the 180th Anniversary of the opening of the London to Birmingham Railway in 1838. The event was held over the weekend of 8th/9th September. It was included in the Heritage Open Days calendar and catalogue for 2018. 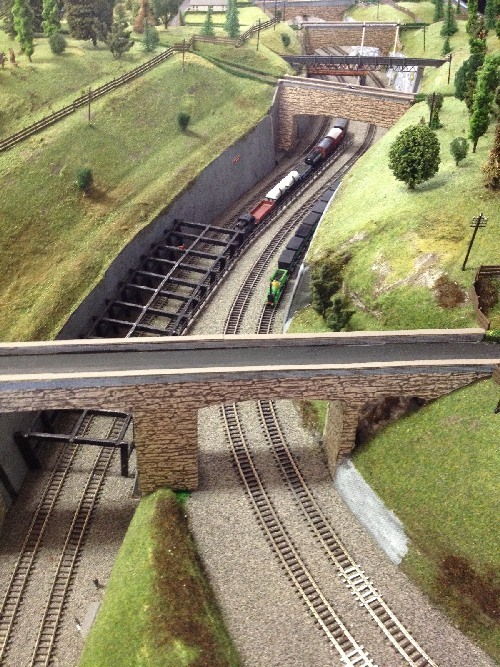 One of the most challenging and time consuming elements of the line’s construction was the excavation of Roade Cutting, which ranks as one of the major engineering achievements of its day. 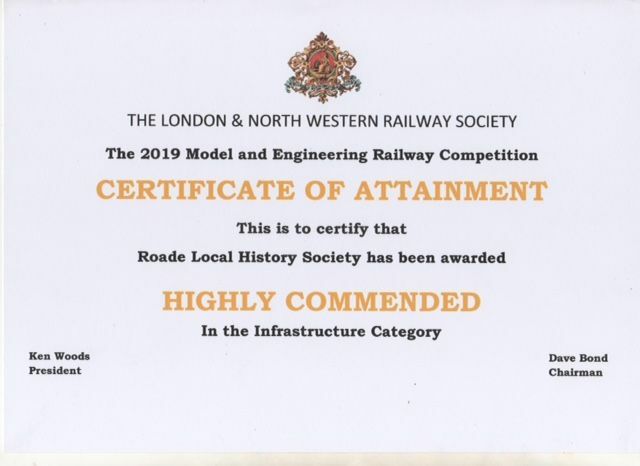 The Society applied to have this feat recognised by the Transport Trust by awarding it Red Wheel status, this prestigious accreditation being a highly sought after recognition of significant transport heritage. The application has been successful and the Red Wheel was unveiled during the event. The Cutting was the last obstacle to the opening of the world’s first long-distance intercity railway. Our event to mark this anniversary included a representative scale model with a detailed history of the trials and tribulations which befell our community during its building and widening, and the social and economic impacts on the area. We are grateful for the tremendous help we received with making the model from the Elizabeth Woodville Schools at both Roade and Deanshanger and society members and a resident Artist. 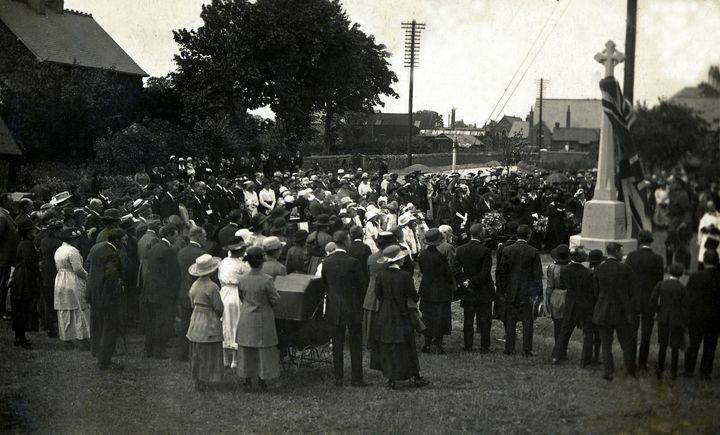 The event also remembered the significant loss of life which befell the Navvies and pioneering railway company servants, and included previously unseen film and images of the locality. 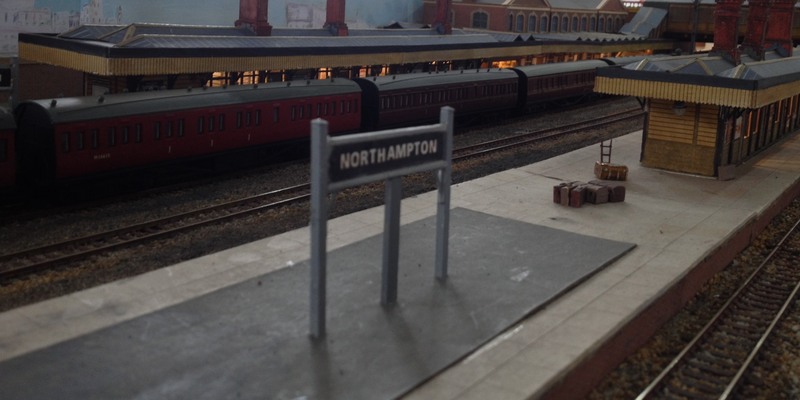 Many other groups and individuals supported this event, including the Northampton Model Railway Society displayed a period model of Northampton Castle Station. L to R: John Martin, Michael Pearce, Chris Hillyard, Jarred Chapman. John and Chris are RLHS members. Michael is a teacher and Jarred is a student at Elizabeth Woodville school. Many visitors enjoyed guided tours of Cutting sites. The exhibition was attended by David Wortley of 360in360 Immersive Experiences, who has kindly posted to Youtube some spherical videos he took of the event. In these, it is possible to pan around the video (left and right, up and down) as though you were there at the time and turning your head...........drag the video around on the screen with your mouse or use the arrow controls in the top left of the Youtube videos and have a go! Roade Local History Society has installed a small memorial to commemorate six Canadian airmen who lost their lives when their Wellington bomber was struck by lightning over Roade in 1944. Please click here for more details and photos. Full Circle - connecting people with the screen heritage of the Midlands. Tucked away in boxes in attics and sheds,cupboards and garages are the filmed records of families and communities which are a uniquely important window into our local and community history. The Media Archives for Central England (MACE), the regional moving image archive for the East and West Midlands, is seeking 60 partner organisations to look for this valuable material in their own communities as part of a project to find and uncover the hidden filmed heritage of the midlands. The project will provide new copies of film for depositors and for community use in local schools, community archives and local collections. It will ensure the long term preservation of the materials found so that it can go on being used by future generations. 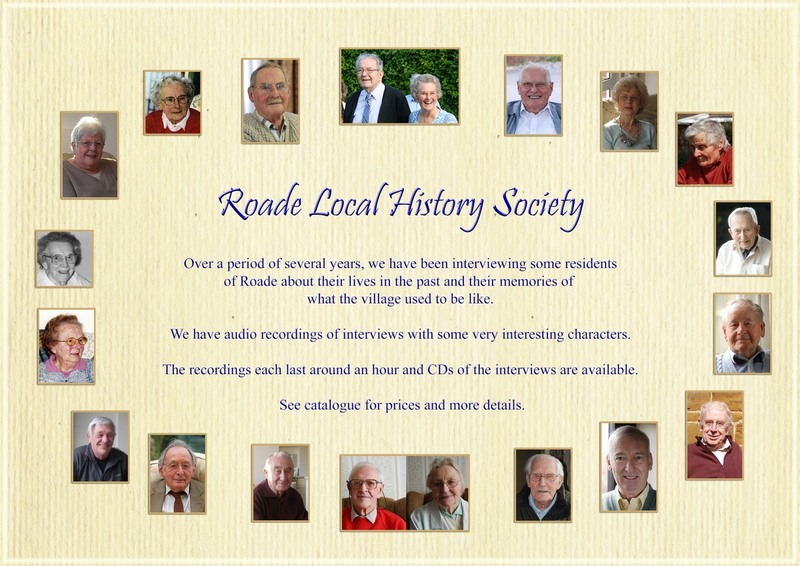 Roade Local History Society has received several films that qualify for free copying for the owners. We will be holding a film show in the New Year, but meantime would welcome talking to anyone who has potentially suitable films that they may no longer be able to view and would like converted to DVD. This covers films of such things as public events, shows, gatherings, scenes, etc in Northamptonshire, but does not include films of holidays or family. The launch, in September 2009, of our publication ‘Roade Through the Camera’ was very successful and currently over 900 books have been sold. Copies can be purchased in the village at T & H Newsagents in the High Street or by post – please see our Publications page for further details. We are building a comprehensive archive of photographs and documents about Roade for research and publication. To date we have produced 'Roade Roll of Honour’, ‘Roade Through The Camera’ and 'Roade Village Scrapbook 1953'. We also have a library of back issues of various local history magazines and publications available on loan to members. 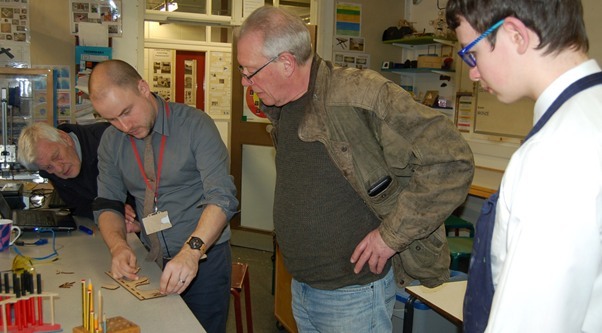 We have been organising events related to local history since May 2005. These normally cover Roade and its environs and sometimes the wider county. A feature of events has been 'Sons and Daughters of the Village": presentations by residents, past and present, who have created history in their lifetime or have interesting reminiscences about their life in Roade. Events take place every month (except August) and start at 7.30pm in St Mary"s Church Hall, unless otherwise stated. Non-members are very welcome. Entry is £3.00 per person for non-members or £2.00 for members and refreshments are available. Talks may be subject to change if necessary. For details of our next event, please see What's On or Roade News or the Notice Boards around Roade.